Kingfisher Fly Shop has a report for the Bitterroot River! The Bitteroot is on the rise and is getting a little colored up. The Bitteroot flows have been really low, so some more water is a welcome sight. Fish have been getting more and more dialed on the skwala dry every day. Afternoons are your best shot. Red San Juans, pink San Juans, little olive Sloans, purple princes, olive/brown rubber legs, skipper stones, turd birds, and big PT’s will keep you busy in between dry fly eats. Nymphing is still the best bet for catching the most fish, but fishing a skwala with a long dropper will get it done as well. Streamer fishing has been ramping up too. This push of water might put some fish on the banks, but most of our streamer eaters have been deep in seams and holes. Weather does not look awesome this weekend, but hey, that’s skwala season in a nut shell. Swing by the shop for some Gore-Tex and skwala’s! 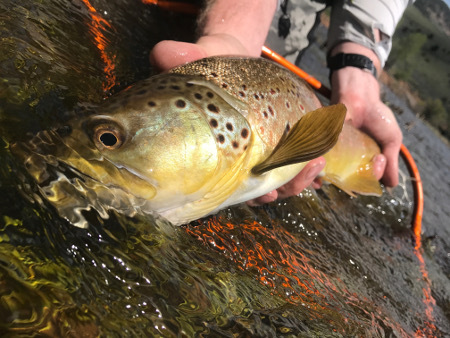 Click here to check out the water flow information for a few different areas on the Bitterroot River, and learn how to make one of their favorite Skwalas on the Kingfisher Fly Shop website.